Algernon Sidney Gilbert was a leader in the LDS Church (The Church of Jesus Christ of Latter-day Saints) in the early days of the restoration. He was born on December 28, 1789, in New Haven, Connecticut, to Eli Gilbert and Lydia Hemingway. 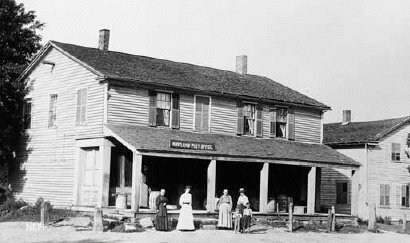 After owning a store in Michigan, Gilbert purchased a 2,500 square foot store in Mentor, Ohio, in 1820. Newell K. Whitney worked in the store and learned the business, until some time in 1821. Gilbert married Elizabeth van Benthuysen of Chagrin in 1823, and the store failed shortly thereafter. Gilbert lost the store, but rented it back. By 1827, he had relocated in Kirtland, Ohio. 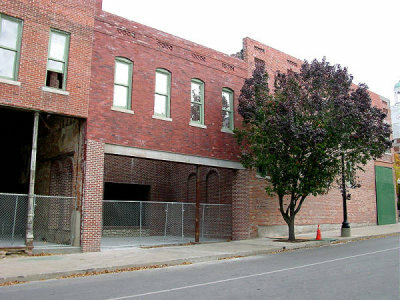 Gilbert moved into N. K. Whitney's red store in Kirtland as partner in N. K. Whitney and Company. Gilbert and his wife were Methodists at the time, but they joined the LDS Church in 1831. Gilbert was ordained an Elder in the Church and called to be a church agent to travel to Missouri with the Prophet, Joseph Smith. Gilbert moved to Independence, Missouri, and he operated a store there. In December of 1832 Gilbert wrote a letter to Kirtland that offended church leaders. In January, Orson Hyde and Hyrum Smith replied on behalf of a conference of high priests that included the presidency of the High Priesthood. They reproved Sidney Gilbert for "blind insinuations," "pretensions to holiness," and "covetousness." Gilbert is mentioned several times in the Doctrine and Covenants. In section 90, the Lord said, "Nevertheless, I am not well pleased with many things; and I am not well pleased with my servant William E. McLellin, neither with my servant Sidney Gilbert; and the bishop also, and others have many things to repent of." In July, 1833, a gathering of Jackson county citizens declared that Mormons must leave the county immediately. They presented their demands to W. W. Phelps, Sidney Gilbert, and Bishop Edward Partridge, who asked for time to consult with other leaders in Missouri and Ohio. The mob razed the printing press office and forced Sidney to close the store. They tarred and feathered Edward Partridge and Charles Allen. W. W. Phelps, Edward Partridge, John Corrill, John Whitmer, Isaac Morley, and Sidney Gilbert met a few days later with the Jackson County citizens' committee and offered themselves as a ransom for the Church. They said they were "willing to be scourged or die, if that would appease their anger toward the church." Instead, the citizens agreed to stop the violence, and the Mormons agreed to leave the county by April 1, 1834. But the Missouri citizens pre-empted the leave date promised by the Saints and agreed to by the committee. On November 4, 1833, a mob destroyed a portion of Sidney's home, and they threw store goods into the street. Gilbert intervened, restraining one citizen. The mobber then filed a complaint for assault and false imprisonment. Sidney and others were jailed for a day, then released. Sidney fled to Liberty in Clay County, where he established another store. The Lord revealed to Joseph Smith (Doctrine and Covenants, section 101) that the Saints driven out of Independence should not sell the property they owned there, but that they should retain it. Gilbert had abandoned his store in Independence. In June of 1834 Gilbert was called to receive the endowment ordinance in the Kirtland Temple, help gather the Saints, and proclaim the gospel until Zion was redeemed, but Gilbert said he couldn't do it. Many of the men who led the Church repeatedly made huge sacrifices to fulfill the Lord's requests through His Prophet, but Gilbert stopped short of this one. That summer, the Prophet organized Zion's Camp at the command of the Lord. The brethren who were willing to participate left their families in Kirtland during planting season and set off with the Prophet to reclaim Zion in Missouri. The Lord absolved them of the duty at the last minute, but those who went not only sat at the Prophet's feet to be taught for weeks, but faced all sorts of trials that the Lord called an "Abrahamic sacrifice," qualifying themselves for the greatest blessings and responsibilities of the kingdom. On June 25, 1834, Zion's Camp reached Sidney Gilbert's property in Liberty, Missouri, and camped on the low lands of Rush Creek. That night the camp was struck by cholera. Several died in agony, those being dissenters against the authority of Joseph Smith. Sidney Gilbert himself had become a dissenter. He had been called to preach, "and he said he would rather die than go forth and preach the gospel to the Gentiles. The Lord took him at his word; he was attacked with the cholera and died about the 29th" (Minutes of June 23, 1834). Gilbert died on June 29, 1834, near Fishing River, Clay County, Missouri. Elder B. H. Roberts wrote of Brother Gilbert, “The remarks in the body of the history, and this expression from Elder Kimball’s journal are liable to create a misunderstanding concerning Brother Algernon Sidney Gilbert, than whom the Lord has had few more devoted servants in this dispensation” ( History of the Church, 2:118n). Gilbert had sacrificed his property more than once, but he had a fear of preaching the gospel. This page was last edited on 3 September 2010, at 21:32.